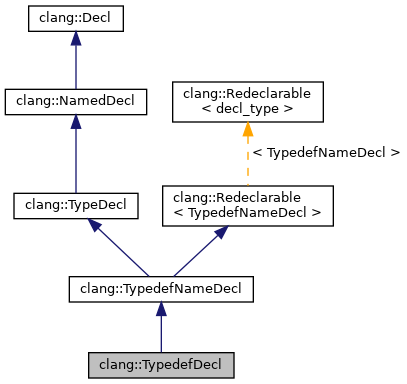 Represents the declaration of a typedef-name via the 'typedef' type specifier. Definition at line 3017 of file Decl.h. Definition at line 3031 of file Decl.h. Definition at line 3032 of file Decl.h. Definition at line 4545 of file Decl.cpp. Definition at line 4590 of file Decl.cpp. Definition at line 4607 of file Decl.cpp. References clang::Decl::getBeginLoc(), clang::Decl::getLocation(), and typeIsPostfix().